Find hotel near Greenpoint Park And Biodi .. 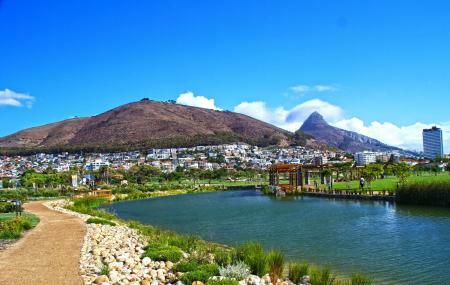 Spread over 12.5 hectares of land, this natural enclave is a part of the green goal legacy projects of Cape Town city. A legacy project developed for the FIFA 2010, this park has alluring walkways, green areas, seating, water features and ponds. There are also cycling oaths, jogging tracks, and outdoor exercise gym and adventure play-park for kids to spend time in the park. The outdoor Labyrinth is great place to relax and ideal for picnics and day-outs. You can pack your lunch and make a day out of it. Also, visit the popular attractions in the city by following Cape Town itinerary 5 days. Alcohol, swimming, loud music, flower picking, camping, unauthorised hawking and busking are not allowed. How popular is Greenpoint Park And Biodiversity Garden? People normally club together Lions Head And Signal Hill and Two Oceans Aquarium while planning their visit to Greenpoint Park And Biodiversity Garden. Such a lovely place to take the family for the day. Beautifully kept park with a vast playground. If it didn't get so cold we would have spent the entire day there! The pond was a highlight. We had a nice family picnic and enjoyed the great atmosphere. If we lived closer we would be there every weekend! It feels really great to have such a large open space right in the center of the city, and it's close to the ocean. The amount of activities one is able to do there seems to be good for families, and there an outside gym. It was also clean and well looked after when I was there last, so, nice one Cape Town. A great place to go if you want to just rest and see how the kids play in the park. For fitness junkies there is loads of space to walk around or to run. And for those who wants to get rid of that extra lil fat there is a gym on the park also. There is space to have a kids birthday party also. Its a safe place and the smell of the sea nearby is very calmly too.